One of the downfalls of any well-intentioned diet plan is a love of snacking. I tend to go through times when I crave a sweet snack, and then other times when I want something crunchy, crispy, and salty. I simply adore crispy foods for snacking, don’t you? I think everyone has a passion of some sort for chips, and I certainly do. I have reviewed many of my favorites in the past, such as Kettle brand unsalted chips and Kay’s Natural protein chips. 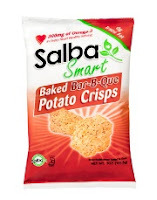 I have found a new “love”, however, in Salba Smart Baked Potato Crisps. These are so delicious – and I love the fact that they are baked, not fried. I found these at my local Whole Foods, and I just had to try the Baked Bar-B-Que flavor, which weighs in at just 120 little calories (3 weight watchers point plus points). There’s also an original flavor and a cheddar and sour cream flavor, as well as three types of organic tortilla chips in white, blue, and yellow corn varieties. I hadn’t heard much about salba before, but I did a bit of investigating after tasting these top notch yummy chips. Salba Smart products are made with salba, which is a nutrient and mineral rich whole grain. The salba in these chips is, according to the Salba website, grown under strict growing conditions by a family of growers in Peru. Salba has been shown in a clinical study to aid in the management of type II diabetes. Per the Salba website, a serving of salba has a third more antioxidants than blueberries, twice the potassium of bananas, six times the calcium of milk, a fourth more fiber than flax seed, six times the iron of kidney beans and five times the folate of spinach. All I can say to all that is WOW! These chips are definitely not lacking nutritionally! These chips are available at natural food stores as well as online at Amazon.